Nikon Laserforce vs. Vortex Fury Review - Best Comparison in 2019 April! Nikon is a leading global electronics and optics giant from Japan that has over a century of experience in delivering the highest quality electro-optical devices. Vortex is a newcomer by all standards, and as a cheeky kid on the block, Vortex dares to stand up to the eternal Nikon‘s Laserforce with their Fury model. In this article, I compare both models to find out which one is worth its price tag and take into consideration that both devices are priced equally, which is part of the comparison. So with the price being equal, what’s left is performance, let’s go check them out. 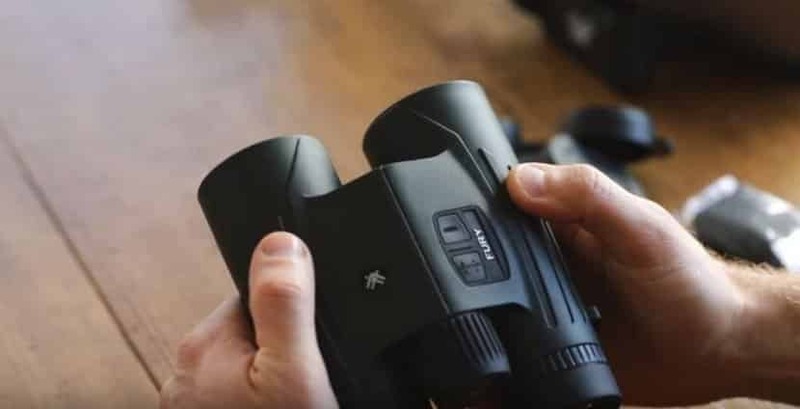 Nikon has come up with an exceptional quality hybrid binocular that combines the extreme speed and ranging technology of a 1900-yard laser rangefinder with extra-low dispersion (ED) optics giving you their 10×42 Rangefinder Binoculars. Essentially, the Laserforce is the ultimate long-distance range finding experience that any hunter can wish for and use. 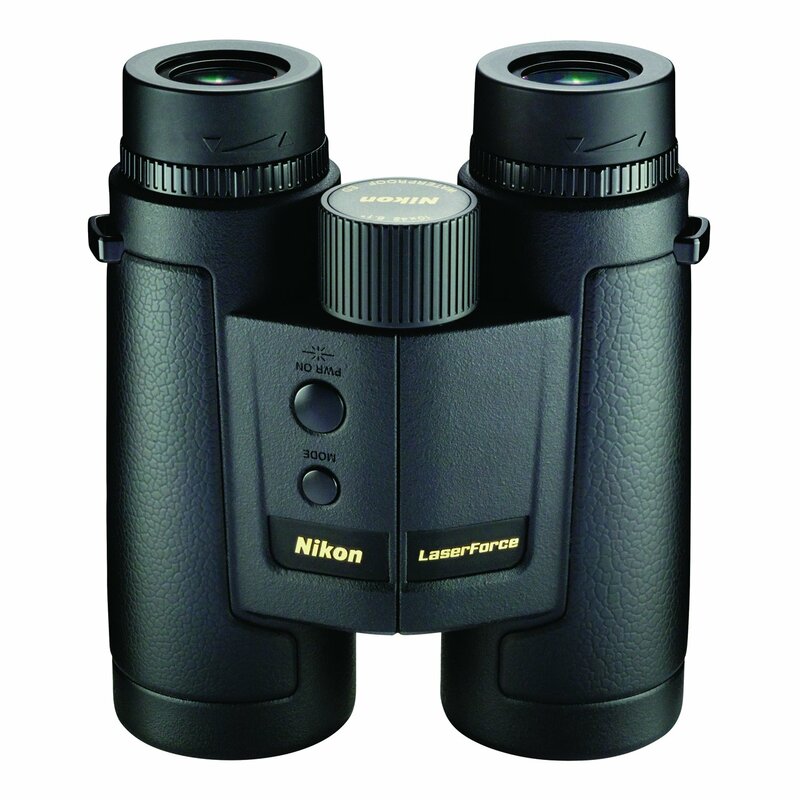 This set of binoculars comes with Nikon’s ID Technology that compensates for incline or decline angles and is both fast and accurate from distances ranging between a 10 to 1,900 Yard Range. 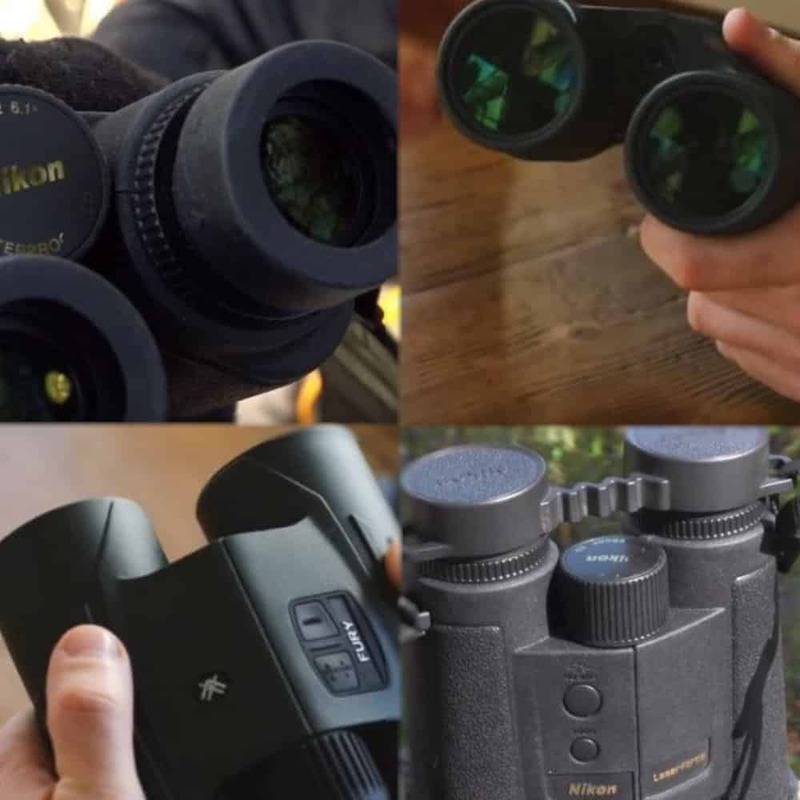 These binoculars provide you with a very bright and clear display using 4-step intensity adjustments. The overall performance delivers an easily readable target range under any lighting conditions and against various subjects. The body is made from a die-cast aluminum alloy and is nitrogen poured top provide a fog proof interior. The exterior and frame are sealed for waterproof, and the overall structural integrity delivers a shockproof product. You also get single or continuous measurement up to 8 seconds, and the display adjusts in increments of 0.1m/yard under 100m/yards and in 1m/yard when over. There is an auto power shut-off function that is designed to save battery life by shutting down after 8 seconds of non-use. ID (Incline/Decline) Technology that provides the horizontal distance to the target with +/- 89 degrees (nearly vertical up or down). 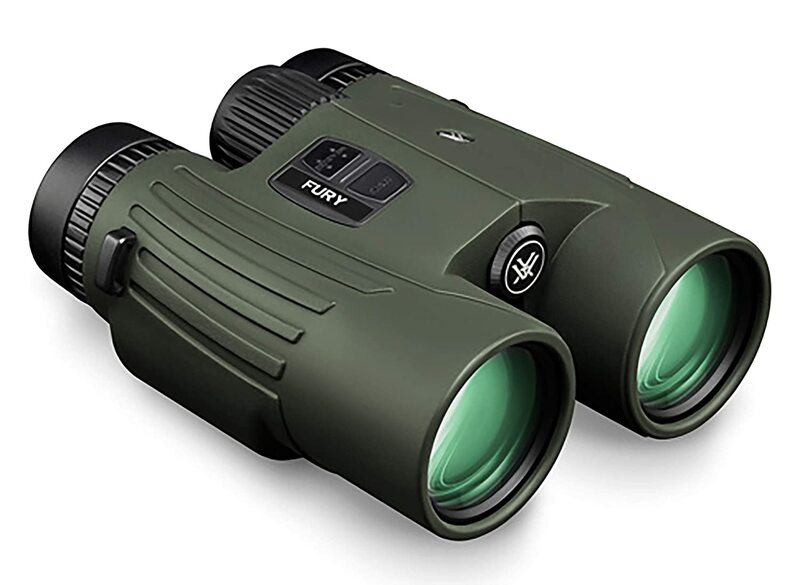 The Fury™ HD 10×42 Laser Rangefinding Binocular is Vortex’s latest response to this category of products on the market, and Vortex is not making ripples in the world, it’s a blowing tidal wave of disruption. The Fury is made with Vortex high-quality optics that use proprietary XR anti-reflective coatings. The XR is fully multi-coated on all air-to-glass lens surfaces, and increase light transmission for maximum brightness. They also coat the roof prisms with a phase correction surface treatment that enhances resolution and contrast. The body is made from a machined die-cast aluminum alloy and is nitrogen purged, sealed with O-rings to provide a comprehensive waterproof, fogproof and shockproof product. With this excellent optic range, Vortex added the HCD (Horizontal Component Distance) angle-compensated ranging technology. HCD speeds up the readout up to 1,600 yards and makes for faster target acquisition. The Fury comes with a Line of Sight (LOS) mode that displays the actual line of sight range. 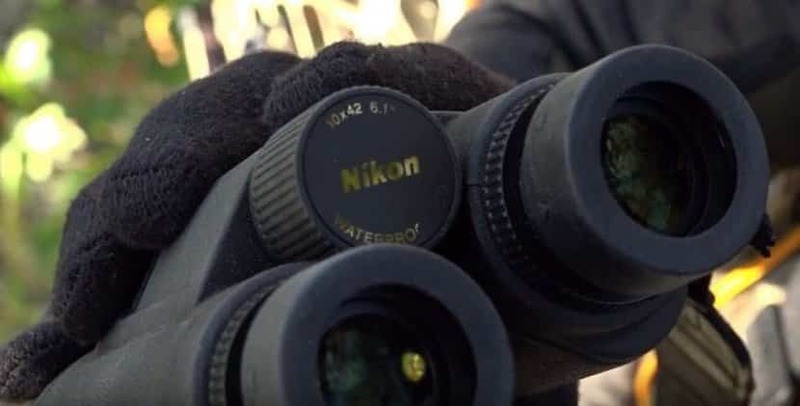 The high-quality optics and long-distance ranging capability are paired with an angle-compensated rangefinder that uses right side controls and gives a reflective range of 10 to 1,600 yards, and a deer range of 10 to 1,000 yards. Illuminated Right Barrel Display for yards or meters. Horizontal Component Distance (HCD) mode for angle compensated ranging. Line of Sight (LOS) mode displays the actual line of sight range. 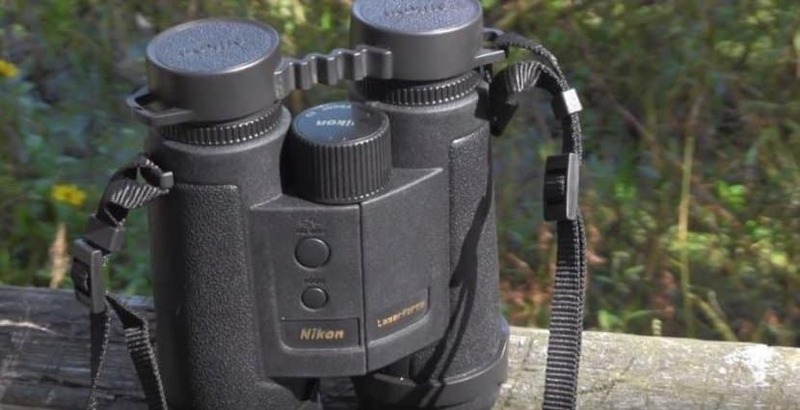 The Nikon gives you the angle to the target, calculates the horizontal distance for angled shots and has independently adjustable diopters to calibrate the optics for each eye. The Vortex provided a simple one-handed handling option with only “range” and “menu” buttons for managing, and the glass was very good however the laser feature is slightly slower (~1 -second delay) than Nikon. Both models have a built-in inclinometer; the Nikon calls it Advanced ID while the Vortex is named HCD. Both the Vortex and the Nikon seem to come out of the same manufacturing plant since their specs are similar. However the Fury has rubberized armor that gives it a chunkier feel, and if you like that gummy feel then this is better for you, however, it does tend to attract dust and hair faster than the Nikon. The Laserforce ranges up to 1,900 yards while the Fury only goes up to 1,600 yards, to be fair, 1,600 yards is enough for real-world testing. The lens caps are a bit flimsy on both models, and the device case of the Vortex outsides the plain Nikon case hands down. In terms of operation and ergonomics, both are equally attractive in this performance category since both models have flush mount buttons with tiny raised letters. This is perfect for an ideally warm and dry environment, but when you go tracking and hunting in the winter when you wear gloves, both fail on this mark, since it’s hard to press buttons while wearing gloves. In terms of brightness, both failed to deliver clear and easy readouts in bright sunlit days, which leads me to state that both need to provide a brighter display. The Vortex did deliver a crisper display when set to the brightest setting, so it has an edge on the Nikon. CA (Chromatic Aberration); both underperformed, where the edges were rough when compared to the center. Eyebox (the ability to quickly acquire a good picture behind an optic), both delivered a fast picture, and this is not eye-relief, this is how fast you get a clear target when you place your eye to the box. Both deliver the same performance in all 6 categories; both underperformed in CA since the edge clarity was a bit misty in both. However the overall edge to edge clarity did remain stable in both. The eyebox on both models provided a fast clear image. However the glass on both is slightly blue-tinged more than other binoculars. 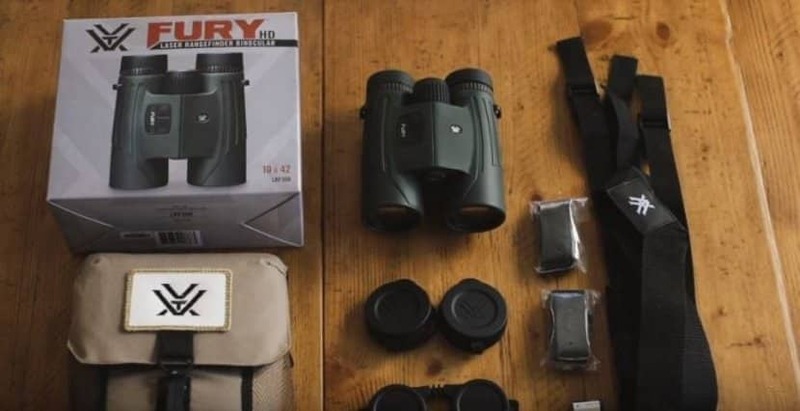 The Vortex Fury is perhaps one of the best budget oriented LRF Binoculars on the market, in comparison the Nikon Laserforce profiled you with the longest range budget oriented LRF Binocular, and for that slight 300-yard difference, outperforms the Vortex. When it comes down to a resolution both, these units delivered stunning performance for their price. In terms of LRF, the Nikon outperforms the Vortex, and for the virtually identical price tag, the only way the Vortex can win is if you want a rubberized grip rather than a plain metal feel. The Bottom line is this is a tie, where the Nikon distance is longer, the Vortex body is more rugged, both perform the same, and for the price you pay, it’s a tossup that only you can decide.